When you think of the types of furniture in a home, a hope chest may not be the first thing you think of, but it is something that is found in most homes. There is a tradition behind hope chests as they are used by young women to store clothing, linen, and other domestic items that they are saving for marriage. 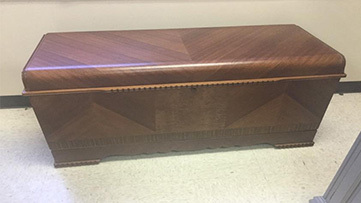 Whether hope chests are being used traditionally by young women, or by people simply for storage purposes, they are beautiful and sometimes old pieces that are typically made from cedar. Wooden hope chests, like other wooden furniture, are vulnerable to all types of damage including water damage, fire, smoke, and physical damage. 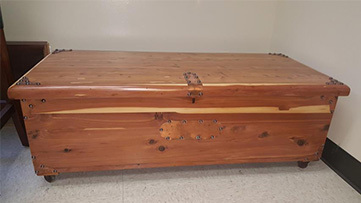 Our expert craftsmen have experience restoring cedar hope chests and can provide expert disaster furniture restoration to restore hope chests that have sustained damage in a traumatic event. 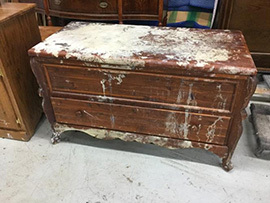 At Furniture Medic by MasterCare Experts, we have restored many hope chests that have experienced different types of damage. The three hope chests pictured below are recently completed restoration projects. 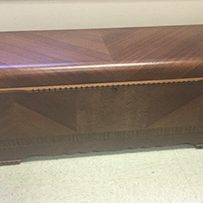 Each hope chest sustained a different level of damage and the clients came to us to repair the damage and restore them back to their previous appearance. In most of our restoration projects involving hope chests, the client wants to pass them down to their children to use and they want the chests to be in good condition. 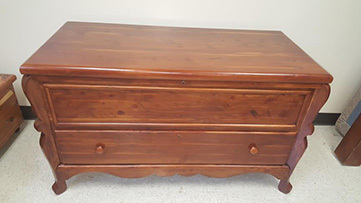 Our craftsmen provide full furniture restoration and repairs if necessary for hope chests while keeping little dings and scratches, and the memories associated with them, intact. These three differently styled hope chests were brought to us with different degrees of damage. 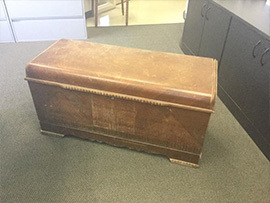 The first hope chest experienced severe water damage and was covered with white residue. The second hope chest also had white marks throughout its surface and the last hope chest was badly scuffed up. For the first two hope chests that experienced water damage, the finish had to be stripped to remove the white marks and reapplied. The “white cloud” marks that appear on wooden furniture occur when moisture gets underneath the wood finish. After the damage is restored, the furniture is refinished to bring back its original appearance. 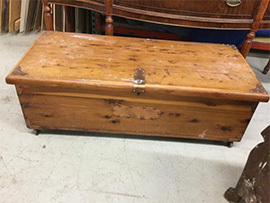 The third hope chest had to be treated with a deluxing process to eliminate the scuff marks and scratches all over the surface while retaining its original luster. After the surface damage was repaired, we color matched to find the appropriate finish and refinished the piece. 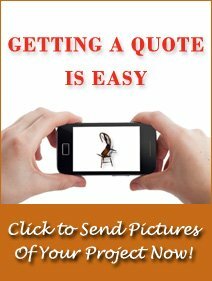 When a piece of furniture has experienced water damage, it is not always due to a disaster. An indoor flood will damage wooden furniture very quickly but there are other forms of moisture that cause less extreme damage that can add up over time. Moisture from humid conditions, spills, and condensation can damage the finish and get to the wood underneath it. If this happens, the moisture can cause significant damage to the wood including splitting, cracking, and warping. All three of the hope chests had to be refinished after the damage was restored. With our furniture refinishing services, we apply water-based factory finishes and we also offer color matching to either restore the original color of the piece or apply a new color. These hope chests were refinished using the original color to preserve their appearance for another generation. Our craftsmen at Furniture Medic by MasterCare Experts are ready to provide complete furniture restoration and refinishing services to help repair and restore your most cherished pieces. We are happy that we were able to bring new life to these hope chests so that they could be passed down and used by a new generation of these families. You can count on our experts to provide quality repair and restoration services and you have the option of color matching the original finish or applying a finish of a new color. 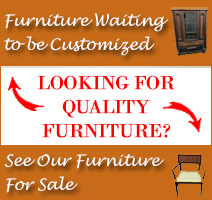 Give us a call at (630) 653-3131 to tell us about your furniture restoration project or submit your project directly to us online.